In a fresh case of internet fraud, the salary account of BJP leader and Karnataka MP Shobha Karandlaje was hacked. More than Rs 15 lakh was withdrawn in the past two months from her salary account in State Bank of India's Parliament House branch. 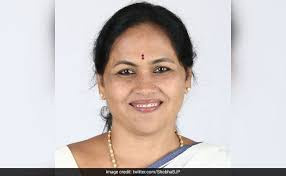 Hailing from Puttur in Coastal Karnataka, BJP MP Shobha Karandlaje represents the Udupi-Chickmagalur constituency. The hack was confirmed by Shobha who claimed that she did not receive an SMS prompt for any transaction. The incident came to light when she went to the bank for some transactions on Monday and when she obtained her bank account statement, she found that Rs 15.62 lakh was withdrawn without her knowledge. Karandlaje approached Parliament Street Police Station on Monday after she came to know about the withdrawal of money. The complaint was filed at North Avenue police station in the national capital. The State Bank of India account was frozen after lodging of complaint. “We have registered a case into the matter at North Avenue police station under relevant sections of Indian Penal Code. It will be transferred to the cyber cell for detailed investigation. We are getting the details of the transactions from the bank to find out whether the transactions were done in the country or from outside the country,” said a police officer speaking to The Hindu. “The police are also probing whether any of the bank staff compromised the bank account details of the MP since she claimed that she did not receive the SMS alert,”a senior police officer said.